Isn’t he so beautiful!?! I cannot stop snuggling him. I am so grateful and blessed to have him be apart of our family. 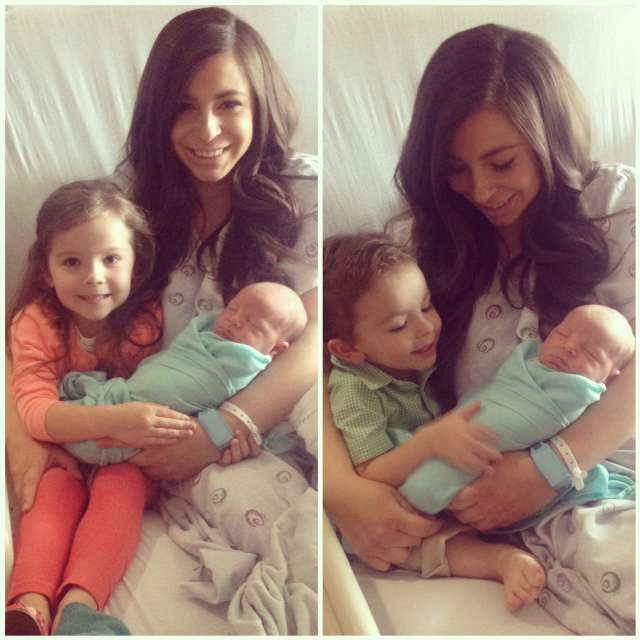 Speaking of family… We are now a family of 5!!! I am still in shock about this little fact. My older two were SO excited to meet their new little brother. And I couldn’t wait to be apart of that tender moment :) Labor and delivery couldn’t have gone any smoother and Everyone is well and we are all having a good time learning to adjust to being a family of 5. Thanks so much for all your support! Now onto the recipe…. I LOVE Nutella :) I eat a couple spoonfuls almost on a daily basis. A few weeks ago, I was down visiting my mom and we were brainstorming something delicious to make. I said, whatever it is- I want it to involve Nutella. Thats when this Nutella Fruit Dip was born. 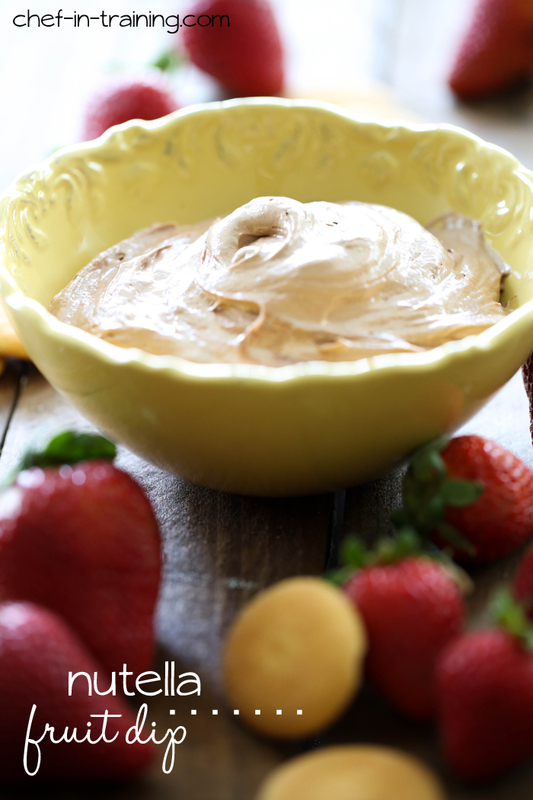 We took our already easy peasy favorite fruit dip recipe and incorporated Nutella. This stuff is GOOD! As in, I can’t get enough of it, kind of good. It only requires 3 INGREDIENTS folks. That’s right. Just the three. Which could be quite dangerous considering I always have these three ingredients on hand. Then you just stir them together and you can dip whatever your heart desires…. Strawberries, bananas, graham crackers, wafers… your spoon. Your choice. Make this for your next crowd and everyone will be asking you for the recipe! This dip only requires THREE INGREDIENTS and is so DELICIOUS! Beat cream cheese and Nutella together until smooth. Stir in Marshmallow Fluff until completely combined. Dip your favorite fruits, graham crackers, wafers or whatever you would like and enjoy! What a cutie! I love the expression on his face. The dip is also lovely, but not as cute. Still very appealing, though! Your baby is beautiful. Your recipe is calling to me. I am going out to today and going to buy all the necessary ingredients. Yum. You know, the marshmellow fluff you can use to make Rice Krispie Treats!!! Yum yum! Oh dear. This is a bad thing for me. I love Nutella and eat it all the time. This will make it worse. You are a really bad influence on me. You should be eating something like kale or something. I am a trained chef - retired - and do not need to, oh, forget it - get me a spoon!!! 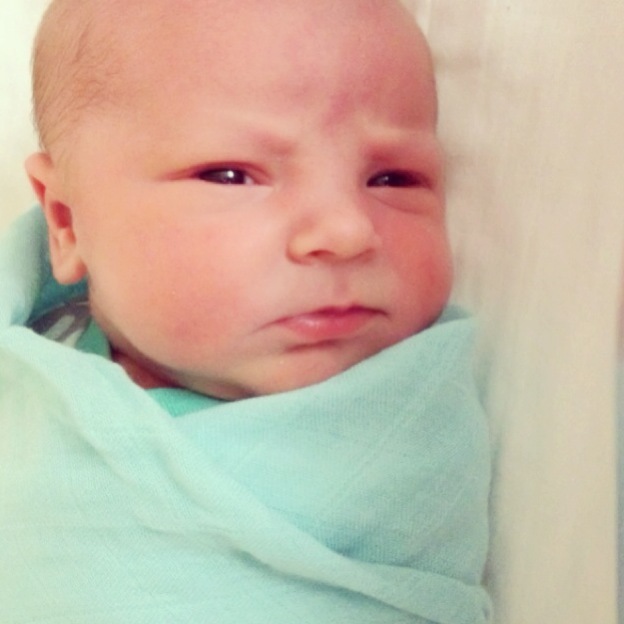 congratulations on the gorgeous new addition to your family!! and thank you for all your wonderful recipes! Love your fruit dip idea. Do you have a recipe for a chocolate mousse that you would recommend - thanks. I love this idea, Nikki. My 7 year old would go crazy for this, no doubt. We had our beautiful little boy on the 21st and are now a family of 5 too. So excited for you! Congratulations!! He is beautiful!! I can see why you just want to cuddle him all the time. You look great too!! Congratulations on your new baby. He's adorable. Keep the great recipes coming! Beautiful family! Enjoying the recipes! Keep em coming! Could you please tell me what Marshmallow Fluff is ? Someone else here may know, but I have never heard of it here in Australia.. Thank you..
Marshmallow Fluff is same as Marshmallow Cream. Found in jars usually in baking isle. Kraft is one maker of it but there are many. Your children are beautiful, and so are you! Thanks for sharing this special moment with us. We were a family of 5 also, until my oldest two got married and had us some wonderful grand babies. May Heavenly Father bless your sweet family! Love your recipes, will definitely use this one! I have tried so many of your recipes. I really enjoy it when friends have your recipes on facebook. Congrats to your new arrival. Your family is beautiful as you look amazing. All I can say is YUM!! Have been making Nutella dip for a while now, but none as good as this! i hope your little one is doing well. What a cutie! I had just finished making regular fruit dip for me nephew's birthday party and as I turned to the shelf...it dawned on me....I should add some Nutella in and see what it tastes like!! So I did a quick search and found your site! Pretty basic and so easy to make. I am wondering if I take my recipe and add the nutella, how it would turn out. My regular fruit dip also has vanilla and just a few teaspoons of OJ. Just going to have to try it out!! BTW Congrats on the newest addition! !